Please let me know your top picks on IM-Predictions! We’re already at round #5 for this season, but there will be a lot more chances to score more points until Kona! The Course Rating for IM Australia is 04:51. IM Australia has 2000 KPR points for the winner. It has a total prize purse of 40k$. There are not too many athletes that are racing with a focus on KPR points. Luke Bell and Peter Robertson are probably the only two athletes that were seriously making plans to race Kona this year, but both are only at around 1.000 points and would need a win (and some more points from 70.3 races) to have a chance for a July cutoff. On the women’s side, Mel Hauschildt is an automatic qualifier as the 70.3 champion, so she just has to validate her slot by finishing. Lisa Marangon (currently at 2.860) is the best placed athlete in the KPR, she would also need a win to make it to Kona. Defending champion Luke Bell has had a good 2013 season (wins in Australia and Mont Tremblant) that don’t end well: A frustrating 31st in Kona, then a DNF in Western Australia and a knee injury. He’s hopefully fully recovered, but not the top pick. This spot goes to Paul Ambrose but he also has few DNFs lately. Other contenders are „newcomers“ (to the IM distance) Denis Chevrot, Peter Robertson and Nick Baldwin, and the „old hands“ Jason Shortis and Matty White. The „headliner“ in the women’s race is Mel Hauschildt. She is racing her first Ironman, so it is hard to estimate how her performance will turn out. She has taken some time top get ready for the race, so if nothing bad happens during the race, she should win comfortably as I can see no one that could challenge her on a good bike and run day. (I’m putting her chances for a win at 50%, not based on previous IM results but based on how good of an athlete she as proven to be on the shorter distances.) 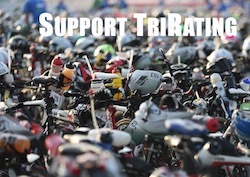 However, if she does run into problems, there are a number of athletes more than eager to win an Ironman race.